To the best of my recollection, this is the first time I have written publicly on the subject of calculus. The fundamental reason for this, explained in detail below, is something I rarely experience: embarrassment. Unless this is the first time you’ve read my blog, you already know I like mathematics. If you’re a regular follower, you know that I take this to certain extremes. My current conjecture is that my original motivation to learn how to speak, read, and write, before beginning formal schooling, was that I had a toddler-headful of mathematical ideas, no way to express them (yet), and learned to use English in order to change that. Once I could understand what others were saying, read what others had written, write things down, and speak in sentences, I noticed quickly that interaction with other people made it possible to bounce mathematical ideas around, using language — which helped me to develop and expand those mathematical ideas more quickly. Once I started talking about math, as anyone who knows me well can verify, I never learned how to shut up on the subject for longer than ten waking hours at a time. A huge part of the appeal of mathematics was that I didn’t have to memorize anything to do it, or learn it. To me, it was simply one obvious concept at a time, with one exposure needed to “get it,” and remember it as an understood concept, rather than a memorized fact. (Those math teachers of mine who required lots of practice, over stuff I already knew, did not find me easy to deal with, for I hated being forced to do that unnecessary-for-me chore, and wasn’t shy about voicing that dislike to anyone and everyone within hearing range, regardless of the situation or setting. The worst of this, K-12, was long division, especially the third year in a row that efforts were made to “teach” me this procedure I had already learned, on one specific day, outside school, years earlier.) It might seem like I have memorized certain things, such as, say, the quadratic formula, but I never actually tried to — this formula just “stuck” in my mind, from doing lots of physics problems, of different types, which required it. Similarly, I learned the molar masses of many commonly-encountered elements by repeatedly using them to show students how to solve problems in chemistry, but at no time did I make a deliberate attempt to memorize any of them. If I don’t try to memorize something, but it ends up in memory anyway, that doesn’t count towards my extremely-low “I hate memorizing things” threshhold. When I first studied calculus, this changed. Through repeated, forced exposure in A.P. Calculus class my senior year of high school, with a teacher I didn’t care for, I still learned a few things that stuck: how to find the derivative of a polynomial, the fact that a derivative gives you the slope a function, and the fact that its inverse function, integration, yields the area under the curve of a function. After I entered college, I then landed in Calculus I my freshman year. Unbeknownst to me, I was approaching a mental wall. My college Cal I class met early in the morning, covered material I had already learned in high school, and was taught by an incomprehensible, but brilliant, Russian who was still learning English. Foreign languages were uninteresting to me then (due to the large amount of memorization required to learn them), and I very quickly devised a coping strategy for this. It involved attending class as infrequently as possible, but still earning the points needed for an “A,” by asking classmates when quizzes or tests had been announced, and only waking up for class on those mornings, to go collect the points needed for the grade I wanted. I did a lot of stupid things my freshman year of college, as is typical for college freshmen around the world, ever since the invention of college. One of these stupid things was attempting to use the same approach to Calculus II, from another professor. About 60% of the way through that course, I found myself in a situation I was not used to: I realized I was failing the class. Not wanting an “F,” I started to attend class, realizing I needed to do this in order to pass Cal II, which focuses on integral calculus. A test was coming up. In class, the professor handed out a sheet of integration formulas, and told us to memorize them. I read the sheet of integration formulas, hoping to find patterns that would let me learn them my way, rather than using brute-force memorization-by-drill. Since I had been skipping class, I saw no such patterns. All of a sudden, I realized I was in a new situation, for me: mathematics suddenly was not fun anymore. My “figure it out on the fly” method, which is based on understanding, rather than memorization, had stopped working. A few weeks and a failed test later, I began to doubt I would pass, and tried to drop the class. This is how I learned of the existence of drop dates for college classes, but I learned it too late: I was already past the drop date. I did not want an F, especially in a math class. Out of other options, I started drilling and memorizing, hated every minute of it, but did manage to bring my grade up — to the only “D” I have on any college transcript. Disgusted by this experience, I ended up dropping out of college, dropped back in later, dropped out again, re-dropped back in at a different university, and ended up changing my major to history, before finally completing my B.A. in “only” seven years. I didn’t take another math class until after attempting to do student teaching, post-graduation . . . in social studies, with my primary way of explaining anything being to reduce it to an equation, since equations make sense. This did not go well, so, while working on an M.A. (also in history) at a third college, I took lots of science and math classes, on the side, to add additional teaching-certification areas in subjects where using equations to explain things is far more appropriate, and effective. This required taking more classes full of stuff I already knew, such as College Algebra and Trigonometry, so I took them by correspondence (to avoid having to endure lectures over things I already knew), back in the days when this required the use of lots of postage stamps — but no memorization. To this day, I would rather pay for a hundred postage stamps than deliberately memorize something. In case you’re wondering how a teacher can function like this, I will explain. Take, for example, the issue of knowing students’ names. Is this important? Yes! For teaching high school students, learning the names of every student is absolutely essential, as was quite evident from student teaching. However, I do this important task by learning something else about each student — how they prefer to learn, for example, or something they intensely like, or dislike — at which point memorization of the student’s name becomes automatic for me. It’s only conscious, deliberate memorization-by-drill that bothers me, not “auto-memorization,” also known as actually understanding something, or, in the case of any student, learning something about someone. I don’t know exactly why my to-this-point “wall” in mathematics appeared before me at this point, but at least I know I am in good company. Archimedes knew nothing of integral calculus, nor did his contemporaries, for it took roughly two millennia longer before Isaac Newton and Gottfried Leibniz discovered this branch of mathematics, independently, at roughly the same time. However, now, in my 21st year as a teacher, I have now hit another wall, and it’s in physics, another subject I find fascinating. Until I learn more calculus, I now realize I can’t learn much more physics . . . and I want to learn more physics, for the simple reason that it is the only way to understand the way the universe works, at a fundamental level — and, like all people, I am trapped in the universe for my entire life, so, naturally I want to understand it, to the extent that I can. (A mystery to me: why isn’t this true for everyone else? We’re all trapped here!) Therefore, I now have a new motivation to learn calculus. However, I want to do this with as much real understanding as possible, and as little deliberate memorization as possible, and that will require a different approach than my failed pre-20th-birthday attempt to learn calculus. I think I need exactly one thing, to help me over this decades-old wall: a book I can read to help me teach myself calculus, but not a typical textbook. The typical mathematics textbook takes a drill-and-practice approach, and what I need is a book that, instead, will show me exactly how various calculus skills apply to physics, or, failing that, to geometry, my favorite branch of mathematics, by far. If any reader of this post knows of such a book, please leave its title and author in a comment. I’ll then buy the book, and take it from there. One thing I do not know is the extent to which all of this is related to Asperger’s Syndrome, for I was in my 40s when I discovered I am an “Aspie,” and it is a subject I am still studying, along with the rest of the autism spectrum. One thing Aspies have in common is a strong tendency to develop what we, and those who study us, call “special interests,” such as my obsession with polyhedra, evident all over this blog. What Aspies do not share is the identity of these special interests. Poll a hundred random Aspies, and only a minority will have a strong interest in mathematics — the others have special interests in completely different fields. One thing we have in common, though, is that the way we think (and learn) is extremely different from the ways non-Aspies think and learn. The world’s Aspie-population is currently growing at a phenomenal rate, for reasons which have, so far, eluded explanation. The fact that this is a recent development explains why it remains, so far, an unsolved mystery. One of things which is known, however, is the fact that our status as a rapidly-growing population is making it more important, by the day, for these differences to be studied, and better understood, as quickly as the speed of research will allow, in at least two fields: medicine, and education. Only one thing has fundamentally changed about me, regarding calculus, in nearly 30 years: I now want to get to the other side of this wall, which I now realize I created for myself, when I was much younger. I am also optimistic I will succeed, for nothing helps anyone learn anything more than actually wanting to learn it, no matter who the learner is, or what they are learning. In this one respect, I now realize, I am no different than anyone else, Aspie or non-Aspie. We are all, after all, human beings. 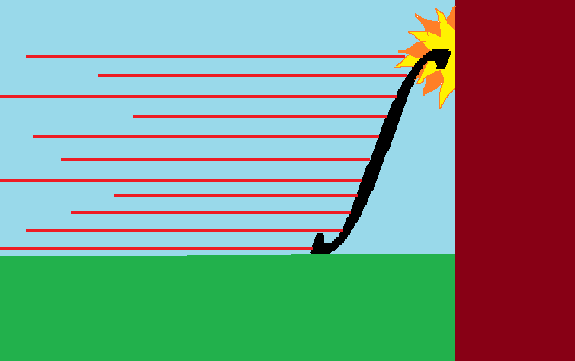 This entry was posted in Asperger's, Education, Life, Mathematics and tagged calculus, college, Education, hit a wall, hit the wall, integral, integration, learning, math, Mathematics, memorization, memorize, memory, school, teaching, wall by RobertLovesPi. Bookmark the permalink. This looks like learning calculus will be an interesting journey. I definitely like the idea of learning from the masters better than just knowing how to use a website. I can tell what both would feel like; one would feel honest, while the other would feel like cheating. I can’t emotionally handle the feeling that I am cheating at math. I do not claim this is normal, typical, or even beneficial. For that matter, I won’t even claim it would make sense for anyone else. However, there’s a prepared tunnel in my mind now with a route chosen for this approach, grown there in my sleep. It will be interesting to see how this develops. Newton’s approach is intuitive, but limited (it does not handle well higher derivatives). Newton did not become famous for his invention of calculus (Fermat had been there before), but for his mastery of intricate problems. The heaping of glory on Newton was done later, by erasing the enormous contributions of centuries of older masters. Theorems of calculus were demonstrated as early as, and by, Oresme (circa 1360 CE), one of Buridan’s students. As the centuries went by, newer and powerful, or different methods were evolved to treat increasingly intricate problems. This may not be finished: after all non-linear PDEs have no magic bullet (as far as we know).